Glass substrate with fired-on, transfer-printed glaze from photos of real jasper. Similar weight, slight translucency, RI, glassy surface and conchoidal fracture as good jasper, but looking under magnification with directional lighting as in the photo, you can see the web pattern from the printing. I expect they've improved that with better technology in the years since. Immediate tip-off to me when looking online was that both earrings had the exact same pattern (not even bookmatched), though that clumsy misstep could have been by now also be addressed by more astute sellers. 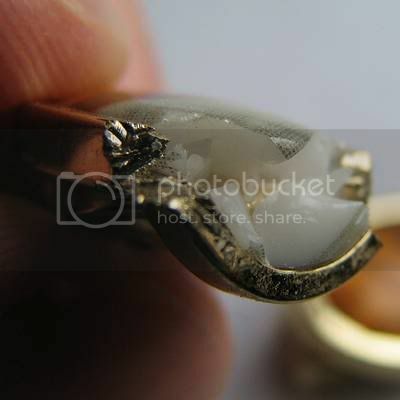 These fakes using patterns derived from genuine stone have been sold in various popular standard cabochon sizes, some more difficult to detect and more detailed (esp. in the larger pieces) than this one. Thanks for showing that. The first thing I noticed even before reading your description was the webbing. That should be easy to spot, even with a common jewelers loupe of at leeast 10X. Stunner. Thanks for the detective work. Yeah, that web pattern is easy to see through a loupe, since the choices for making photo transfers back then were either silk screen or, as I suspect, a low-res inkjet type printer that produces that sort of pattern. Printing with non-inks has improved in resolution quite a bit since then, so it would be harder to spot if produced today. Now that they can print 3D, self-glazing ceramics with color all the way through, it is now possible to print the entire cab. I'm waiting to find one of those, since they are already using them to print fake "antique" ceramics. If anything has any value at all, seems there are plenty of folks out there willing to fake it. Thats a new style of fake to me, thanks for showing. 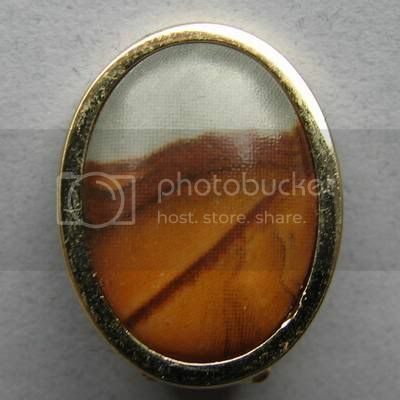 I've seen glass cabs before that to me were very obviously well patterned glass being marketed as agate. When I mentioned something to the seller at the show, I got looked at like I had grown horns. Not sure they even understood what I was saying. Thanks for sharing that fake; the pixelation is entertainingly bad. Seen a lot of so-called "African Turquoise" on the Chinese/Indian markets lately. Sometimes it's a nice looking Jasper mined in Africa, sometimes various stone chips formed from using stinky resin. Sacrifice a bead/small stone and burn it. The smell will usually tell the tale. Usually.